Sugar & Spice Children's Market: Jump, Jump, Jump! We've got something fabulous to entertain your little ones at our market on Sunday! Our lovely friends at Jumping Mania will be bringing one of their super fun and super jumpy jumping castles to St Ambrose Hall in Woodend! Bouncing is FREE for the kiddies all market long. Jumping Mania are the people to go to for Jumping Castle hire. 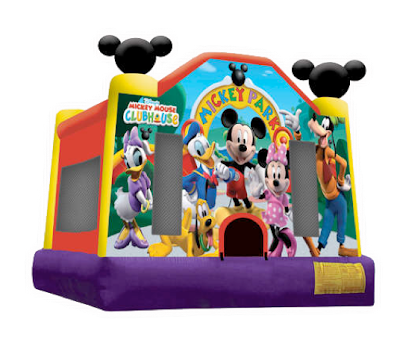 They have 3 castles to choose from: Mickey Mouse, Dora the Explorer and Batman, and all of their castles are cleaned after each use, ensuring your kiddies have a safe and fun experience! Check them out on Facebook or call Cveta on 0410 907 908 or email jumpingmania@live.com.au for bookings or further info. Hope to see you Sunday for some Christmas Fiesta shopping and fun. 9am - 1pm St Ambrose Hall, Corner of Ambrose & Templeton Streets, Woodend.